Cash Shop Update for October 25 | Dexless, Maplestory Guides and More! October 18 to October 31 in the Random Rewards category in non-Reboot worlds only. The Great Gachapierrot has added lots of new items! Celebrate Halloween with new spooky cube chairs! Look for the Halloween Skull Cube Chair, Halloween Zombie Cube Chair, Halloween Vampire Cube Chair, Halloween Cat Cube Chair, and Halloween Pumpkin Cube Chair. Try out the colorful Jack-O-Lantern Chair, Full Moon Night Chair, and Full Darkness Chair. Rule over Halloween with the Black Dragon Devil Throne, Demon Throne, Devil Black Dog Throne, Scary Witch Chair, and Zombie Hunter Chair. Creep through the night with the Count Drokyuli's Coffin Chair, Ghost Story Chair, Halloween Broomstick Chair, and Halloween Pumpkin Chair. Enjoy the Halloween spirit with the Dual Birk Chair, Ghost Fox Chair, Veritable Pandemonium, Masked Gentleman's Party Flier, and I Heart the Masked Gentleman! Get ready to ride with the Flamefoot Husky Mount, Blue Flame Nightmare Mount, Vellum Mount, Hellhound Mount, and Crimson Nightmare Mount. These mounts are all available as permanent versions. Float away with the Witch's Broomstick Mount, Friendly Ghost Mount, Devil Lucifer Mount, Vampire Phantom's Bat Mount, and Pumpkin Carriage Mount. These mounts are all available as permanent versions. Make your Halloween spookier with a familiar! Get the Jack-o-Lantern, Destroyed Doll, Busted Doll, Fire Steed, Ghost, or Green Phantom. Get the Pumpkin Lantern weapon to make your Halloween complete! New mounts have also come to Andersen's Box! Get the Flamefoot Husky Mount, Blue Flame Nightmare Mount, Vellum Mount, Hellhound Mount, Crimson Nightmare Mount, Witch's Broomstick Mount, Friendly Ghost Mount, Devil Lucifer Mount, Vampire Phantom's Bat Mount, and Pumpkin Carriage Mount. These mounts are all available as 90-day versions. October 18 to October 31 in the Special Promotions > Limited Time category in non-Reboot worlds only. Take home a miniature death incarnate—the Jr. Reaper pet! It comes with a guitar to carry, pet food to eat, a Pet Name Tag, and some useful pet skills and scrolls. Take home this previously deceased pup, Frankie! This little pet has been patched together again and preternaturally reanimated. It comes with a halo to wear, pet food to eat, a Pet Name Tag, and some useful pet skills and scrolls. 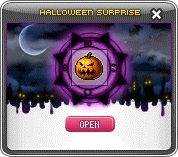 October 18 to October 31 in the Special Promotions > Limited Time category in Reboot world only. Take home some spooky Halloween pets! Pick up Jr. Reaper and Frankie, and let these little buddies join you on your adventures in Reboot World!